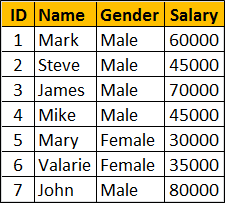 In this video we will discuss writing a SQL query to retrieve all student names that start with letter 'M' without using the LIKE operator. If the interviewer has not mentioned not to use LIKE operator, we would have written the query using the LIKE operator as shown below. The following 3 queries retrieve all student rows whose Name starts with letter 'M'. Notice none of the queries are using the LIKE operator. I also want to point two other methods which will does the same function. Thanks kudvenkat for such such informative videos.